Objectives This meta-analysis investigates the efficacy of tumour necrosis factor α (TNFα) blockers versus placebo for the treatment of ankylosing spondylitis (AS) and non-radiographic axial spondyloarthritis (nr-axSpA). 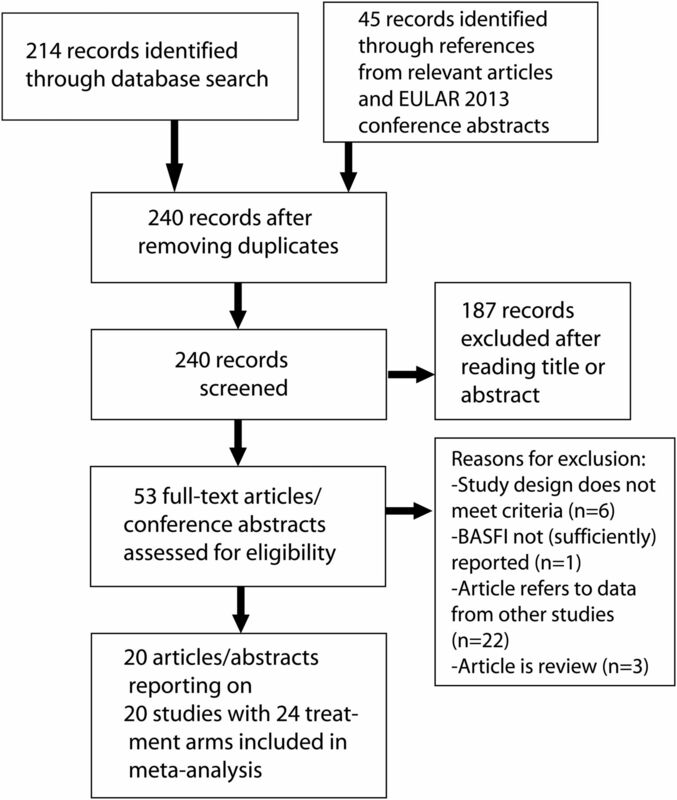 Methods A systematic literature search was conducted independently by two reviewers. Double-blind randomised controlled trials (RCTs) investigating the efficacy of adalimumab, certolizumab, etanercept, golimumab or infliximab in approved dosages in comparison with placebo were included. The use of concomitant non-steroidal antirheumatic drugs was allowed. The outcome parameters were improvement in disease activity and function measured by the Bath AS disease activity index (BASDAI), Bath AS functional index (BASFI) and ASAS40 response. 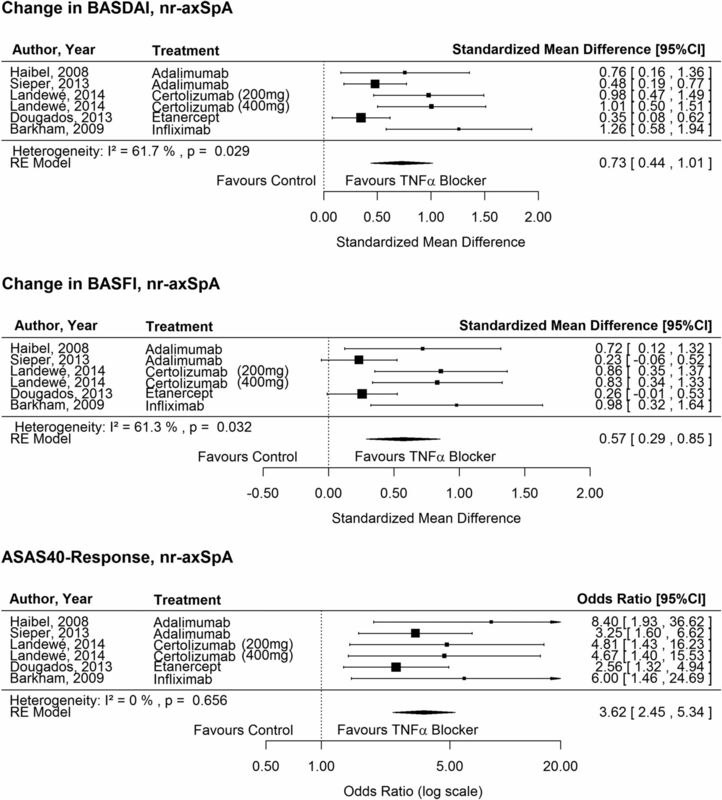 The effect sizes of the changes in BASDAI/BASFI between TNFα blocker and placebo comparator groups were calculated. Mixed effect models were applied separately for RCTs with AS and nr-axSpA patients and differences between those groups were evaluated in a joint model. Results 20 studies with data from 3096 patients were included in the analysis: 15 studies with AS patients, four with nr-axSpA patients and one with both. For AS patients, TNFα blockers showed better efficacy than placebo for BASDAI (effect size 1.00), BASFI (effect size 0.67) and ASAS40 response (OR 4.7). For nr-axSpA patients, the differences were smaller (effect sizes 0.73, 0.57; OR 3.6). However, after adjustment for the year of publication as a proxy for disease severity, no differences in the effect sizes between the AS and nr-axSpA trials were observed. Conclusions Compared with placebo, TNFα blockers improve disease activity and functional capacity clinically meaningful for both AS and nr-axSpA patients. After approval of the first tumour necrosis factor α (TNFα) blocker infliximab for the treatment of patients with ankylosing spondylitis (AS), the treatment of this chronic inflammatory disease has changed remarkably. There is evidence from randomised controlled trials (RCTs) that the treatment with the anti-TNFα agents infliximab, etanercept, adalimumab, golimumab and certolizumab is very effective and leads to an immediate reduction of disease activity, improvement in function and spinal mobility, reduction in pain intensity, signs of inflammation as measured by MRI, acute phase reactants and peripheral arthritis as well as enthesitis. This treatment therefore leads to improvements of almost all clinical features of AS. The efficacy of TNFα blockers was already evaluated by meta-analyses of RCTs. However, even the two recent meta-analyses1 ,2 included only eight or less double-blind placebo controlled RCTs in their analysis of the impact of TNFα blockers on disease activity and function. Currently, data from more than 16 double-blinded RCTs are available for these important patient-reported outcomes. Further, since the clinical characteristics of the patients included in the RCTs have partly changed since licensing, an update of the current evidence of the efficacy of TNFα blockers is needed. Subgroup analyses of RCT data suggest that there is larger improvement of patient-reported outcomes in patients with shorter symptom duration with elevated C reactive protein (CRP) values and better function.3–5 Therefore, treating patients early is also recommended in AS. This aim led to the development of new classification criteria for axial spondyloarthritis (axSpA) by members of the Assessment of SpondyloArthritis International Society (ASAS).6–9 Patients fulfilling the modified New York (NY) criteria10 for AS are part of this disease entity as well as patients with non-radiographic axSpA (nr-axSpA). In addition to clinical features, the modified NY criteria require the presence of radiographic changes in the sacroiliac joints. These are considered to be a consequence of previous inflammation. Findings of Rudwaleit et al11 and others6 suggest a comparable burden of disease in patients with axial SpA who do or do not fulfil the modified NY criteria of AS. As a consequence, RCTs comparing the efficacy of TNFα blockers with placebo were conducted in patients with nr-axSpA. Compare the findings of RCTs in AS with those conducted in nr-axSpA by considering a possible confounding by disease duration and disease severity of the patients included. A systematic literature research was performed in the databases PubMed and Web of Knowledge using the search terms adalimumab or D2E7, certolizumab, etanercept or (p75): Fc fusion protein, golimumab, infliximab or cA2 and spondyloarthritis or ankylosing spondylitis as well as randomized (or randomised) and controlled or placebo. The search was conducted on 20 June 2013 and updated on 10 December 2013. Additionally, references from relevant articles were included into the search as well as abstracts from the EULAR 2013 congress. Trials had to be placebo controlled; concomitant medication with non-steroidal antirheumatic drugs (NSAIDs) and glucocorticoids were allowed for patients in both treatment and placebo groups. Patients in the verum arms received one of the following TNFα blockers in a dosage that is already approved for AS: adalimumab (40 mg every 2 weeks), certolizumab (400 mg at week 0, 2, 4 then 200 mg every 2 weeks or 400 mg every 4 weeks), etanercept (25 mg twice weekly or 50 mg weekly), golimumab (50 mg subcutaneous every 4 weeks) or infliximab (5 mg/kg every 8 weeks). Patients had to be naive for the TNFα blocker in the study treatment, though the previous intake of another biologic was allowed. Patients had to fulfil either the modified 1984 NY criteria for AS or the criteria for nr-axSpA. Trials which included both patient populations were considered if more than 80% of the patients belonged to one of the diagnostic groups or if results were reported separately for AS and nr-axSpA patients. Double-blinded study duration of at least 12 weeks. Baseline and outcome data of the Bath AS functional index (BASFI) had to be available for the double-blinded periods. The language of publication had to be English. Studies were assessed for eligibility by two investigators independently (JC and AW). Disagreements were resolved by discussion. Data extraction was performed by one of the authors (JC) using a piloted form. From each study we collected the source (main author, journal, year of publication), diagnosis (AS/nr-axSpA), mean disease duration, former treatment failure of NSAIDs, DMARD(s) or biologics, TNFα blocker and dosage, control treatment, mean BASFI, Bath AS disease activity index (BASDAI) and their SD at baseline and week 12 or end of the double-blind period of the study, Assessment of SpondyloArthritis international Society 40% improvement (ASAS40) response at week 12 or end of the double-blind period, number of patients, study duration and whether the analysis was performed on an intention to treat (ITT) population. For trials with an early escape option, the results of the period before early escape were taken. with SDPooled being the pooled SD of the BASDAI in treatment (T) and control groups (C) at baseline (Bl) and study end. A large positive value indicates that for patients under TNFα blocker treatment, the disease activity improves more than for those in control groups. Secondary outcome measure was the OR for being in ASAS40 response. Mixed effects meta-analysis models with a random intercept were used to account for the variability between the studies. RCTs with AS and RCTs with nr-axSpA were analysed separately. In addition and to compare efficacy for AS and nr-axSpA patients, models using type of diagnosis as a categorical covariate were used. Although the inclusion criteria of the AS trials were rather similar, we expected to observe a trend towards shorter disease duration and better function in RCTs conducted more recently. Against the background of the findings of Rudwaleit et al3 and others4 ,5 regarding the predictive value of disease duration, elevated CRP and baseline functional capacity (BASFI) on major clinical response, such a trend would suggest that RCTs in AS patients published more recently are better comparable with the RCTs in nr-axSpA. For these reasons, we investigated the associations among the year of publication, disease duration and BASFI and provided there were associations we used the year of publication as a proxy for the history of the disease severity of the patients enrolled in the RCTs and performed a comparison of the effect sizes and response rates between AS and nr-axSpA RCTs after adjustment for this proxy. In all models, restricted maximum likelihood estimation was chosen as computational method. If the mean BASDAI or BASFI was not available, the median was used instead. Similarly, the IQR was used if SDs were not given. IQRs were transformed to SDs assuming an underlying normal distribution. In cases where SDs and IQRs were not provided, we imputed the mean SD of all other studies. Studies were weighted by number of patients. In two studies, several treatment arms fulfilled the inclusion criteria. Each arm, together with the corresponding placebo arm, was treated as a separate study. To avoid overweighting, the placebo group was weighted by the number of patients randomised to placebo divided by the number of verum arms. This corresponded to a total study weight which equals the total number of patients of all arms included. The consistency between studies was measured by I2, which can be interpreted as the proportion of total variation in the estimates of treatment effect that is due to heterogeneity between studies. I2 is given as a value from 0% to 100% where higher values indicate more heterogeneity. A total of 20 studies with 24 anti-TNFα treatment arms were included in the analysis. Figure 1 gives a description of the study selection process. There were six eligible studies with adalimumab, one with certolizumab, seven with etanercept, one with golimumab and five with infliximab. In 15 studies patients with AS were included, in four patients with nr-axSpA and one included both AS and nr-axSpA patients. In total, data from 1930 patients in anti-TNFα treatment and 1166 patients in control groups were used. Mean BASDAI at baseline for all studies was 6.2 and mean BASFI 5.2. In all of the RCTs, the control groups received placebo while the dosages of NSAIDs, steroids and in some cases DMARDs were maintained for all patients. Detailed baseline characteristics of all studies are shown in table 1. A risk of bias table for the included studies is available as online supplementary material. For the BASDAI, data from 17 TNFα blocker treatment arms were available for AS patients. For BASFI, 18 treatment groups were analysed and 13 for ASAS40 response. The forest plots in figure 2 show the effects of the studies separately. Forest plots of standardised mean differences for Bath ankylosing spondylitis disease activity index (BASDAI), Bath ankylosing spondylitis functional index (BASFI) and ORs for ASAS40 response in patients with ankylosing spondylitis. Overall, TNFα blockers had a high impact on the improvement in BASDAI and a medium effect on the BASFI in AS patients. The pooled estimates for the SMD from the random effects model were 1.00 (95% CI 0.87 to 1.13) for the BASDAI and 0.67 (95% CI 0.58 to 0.76) for the BASFI. These results on a standardised scale roughly correspond to a mean change in BASDAI of 1.5 and in BASFI of 1.4 on a 0–10 numerical rating scale (NRS). In the analysis of the BASDAI, the heterogeneity was moderately large with I2=42%. No heterogeneity between the RCTs for the BASFI was detected (I2=0%). The OR for being in ASAS40 response was 4.7 (95% CI 3.8 to 6.0) for patients taking TNFα blockers compared with patients on control medication. In this model, there was no heterogeneity between the studies with I2=0%. With increasing year of publication we observed a decrease in baseline disease duration and functional limitation in RCTs conducted in AS (figure 3). (A) Mean disease duration of included studies by year of publication. The area of the circles in both plots represents the study weight. (B) Mean Bath ankylosing spondylitis functional index (BASFI) at baseline by year of publication. Five trials with six eligible treatment arms were available for patients with nr-axSpA. All of them reported BASFI, BASDAI and ASAS40 response. Figure 4 shows the effects for the single studies. In nr-axSpA patients, the overall effect of TNFα blockers on the BASDAI and BASFI was 0.73 (95% CI 0.44 to 1.01) and 0.57 (95% CI 0.29 to 0.85). This change on a standardised scale roughly corresponds to a change of 1.1 for BASDAI and 1.3 for BASFI on a 0–10 NRS. There was large heterogeneity between the studies with I2=62% for BASDAI and I2=61% for BASFI. Forest plots of standardised mean differences for Bath ankylosing spondylitis disease activity index (BASDAI), Bath ankylosing spondylitis functional index (BASFI) and ORs for ASAS40 response in patients with non-radiographic axial spondyloarthritis. In patients with nr-axSpA, the mean ASAS40 response was 46% for those in TNFα blocker treatment groups and 15% in control groups. The OR for ASAS40 response was 3.6 (95% CI 2.5 to 5.3). There was no heterogeneity present with I2=0%. Based on the observation that AS patients enrolled in the first RCTs had a longer disease duration and a more severe disease than those AS patients enrolled in more recent trials, we compared the findings of AS and nr-axSpA RCTs according to two different approaches: a simple unadjusted comparison and a comparison of the SMDs and response rates after adjustment for disease severity by using the year of publication as a proxy (see Methods section). ASAS40 response rates and disease activity observed in RCTs with nr-axSpA patients did not significantly differ from those observed in AS trials (table 2). In the unadjusted analysis, we found that patients with nr-axSpA had a lower improvement in disease activity (p=0.03) and function (p=0.02) than those with AS. However, taking into account AS patients enrolled in the first RCTs were less comparable with nr-axSpA patients, a mixed effects model with the publication year as a continuous covariate was applied. In this adjusted analysis, no significant differences were observed between nr-axSpA and AS patients. The funnel plots for the BASFI, BASDAI and ASAS40 models all show a tendency of large trials to have smaller effect sizes. The tests for funnel plot asymmetry indicate present asymmetry for BASFI (p=0.048) but not for BASDAI (p=0.28) and ASAS40 response (p=0.39). This asymmetry could be explained by different patient populations: trials conducted in 2002 included patients who were more severely ill than those in 2012 (figure 3) and early trials generally included fewer patients than more recent trials resulting in the impression of present publication bias. To our knowledge, this is the first meta-analysis in which the efficacy of TNFα blockers in nr-axSpA patients was investigated and in which this efficacy was compared with that observed in RCTs with AS patients. Applying stronger eligibility criteria than Machado et al1 and including only double-blinded RCTs, this meta-analysis provides furthermore an update of the available evidence regarding the efficacy of TNFα blockers in AS. Data from 20 RCTs with 3096 patients were included. Data on improvement in BASDAI and BASFI were available in 14 RCTs15 conducted in patients with AS, in four RCTs conducted in nr-axSpA patients and in one RCT including both diagnoses. We observed medium to large effects of TNFα blockers on disease activity and physical function with SMDs of 1.00 resp. 0.67. For AS patients, the OR for achieving ASAS40 response was 4.7. The results regarding improvement in BASDAI and BASFI are in accordance with the recently published meta-analysis in AS patients from Machado et al1 who found a mean difference at 12 weeks of the BASFI of 1.39 and of 1.64 for BASDAI as well as a relative risk for being in ASAS40 response at week 12 of 2.77. Our results are also comparable with the meta-analysis of Escalas et al2 who found an SMD of 0.73 for the BASFI. Among the trials with nr-axSpA patients, two large trials4 ,32 resulted in smaller efficacy especially for BASFI and ASAS40 response than the three remaining trials with lower patient numbers. In the trials with certolizumab,19 etanercept32 and infliximab,33 it was a requirement that the patients show acute signs of inflammation in MRI or through raised CRP values. In contrast to this, both nr-axSpA trials with adalimumab4 ,31 did not have such restrictions on patient populations. Especially in the ABILITY-1 trial4 less than 50% of the patients showed signs of inflammation in MRI or had elevated CRP values. Patients in this trial also had relatively long symptom duration, which could be another reason why in this trial the efficacy was lower than in other trials with nr-axSpA patients. For the other large trial on patients with nr-axSpA,32 so far the results are only available as a conference abstract which is why we had no detailed information on the patient collective. Therefore, we cannot investigate the reasons for the lower efficacy in this trial. The results of both of these RCTs show that more RCTs with nr-axSpA patients are needed in order to gain robust evidence on the efficacy of TNF inhibitors in this indication. This analysis confirms that TNFα blockers improve disease activity and physical function clinically relevant for patients with AS and nr-axSpA. No significant or relevant differences in efficacy between patients with AS and nr-axSpA were found.
. 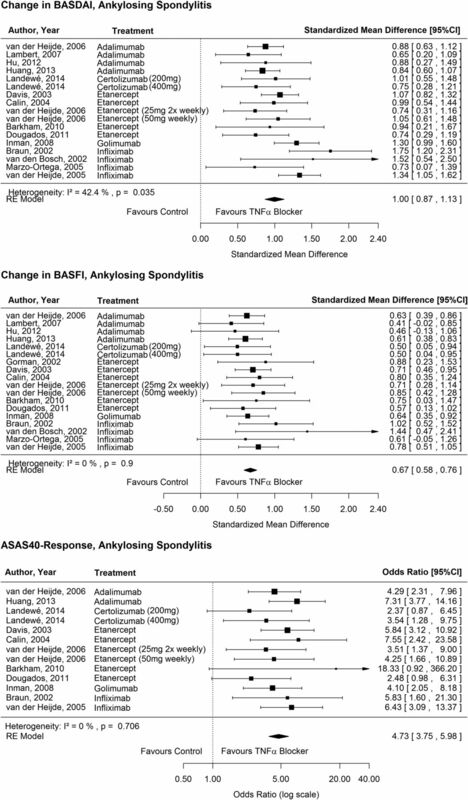 Treatment of ankylosing spondylitis with TNF blockers: a meta-analysis. Rheumatol Int 2013;33:2199–213.
. Evaluation of the treatment effect of NSAIDs/TNF blockers according to different domains in ankylosing spondylitis: results of a meta-analysis. Rheumatology (Oxford) 2010;49:1317–25.
. Prediction of a major clinical response (BASDAI 50) to tumour necrosis factor alpha blockers in ankylosing spondylitis. Ann Rheum Dis 2004;63:665–70.
. Efficacy and safety of adalimumab in patients with non-radiographic axial spondyloarthritis: results of a randomised placebo-controlled trial (ABILITY-1). Ann Rheum Dis 2013;72:815–22.
. Predicting the outcome of ankylosing spondylitis therapy. Ann Rheum Dis 2011;70:973–81.
. The development of Assessment of SpondyloArthritis international Society classification criteria for axial spondyloarthritis (part I): classification of paper patients by expert opinion including uncertainty appraisal. Ann Rheum Dis 2009;68:770–6.
. Regression methods to detect publication and other bias in meta-analysis. In: Rothstein HR, Sutton AJ, Borenstein M, eds. Publication Bias in Meta-Analysis: Prevention, Assessment and Adjustments. West Sussex, UK: Wiley, 2005:99–110. R Core Team. R: a language and environment for statistical computing. Vienna, Austria: R Foundation for Statistical Computing, 2013.
. Conducting meta-analyses in R with the metafor Package. J Stat Software 2010;36:1–48.
. Efficacy and safety of adalimumab in patients with ankylosing spondylitis: results of a multicenter, randomized, double-blind, placebo-controlled trial. Arthritis Rheum 2006;54:2136–46.
. Adalimumab significantly reduces both spinal and sacroiliac joint inflammation in patients with ankylosing spondylitis: a multicenter, randomized, double-blind, placebo-controlled study. Arthritis Rheum 2007;56:4005–14.
. Adalimumab significantly reduces inflammation and serum DKK-1 level but increases fatty deposition in lumbar spine in active ankylosing spondylitis. Int J Rheum Dis 2012;15:358–65.
. Efficacy and safety of adalimumab in Chinese adults with active ankylosing spondylitis: results of a randomised, controlled trial. Ann Rheum Dis 2014;73:587–94.
. Efficacy of certolizumab pegol on signs and symptoms of axial spondyloarthritis including ankylosing spondylitis: 24-week results of a double-blind randomised placebo-controlled Phase 3 study. Ann Rheum Dis 2014;73:39–47.
. Treatment of ankylosing spondylitis by inhibition of tumor necrosis factor alpha. N Engl J Med 2002;346:1349–56.
. Recombinant human tumor necrosis factor receptor (etanercept) for treating ankylosing spondylitis: a randomized, controlled trial. Arthritis Rheum 2003;48:3230–6.
. Outcomes of a multicentre randomised clinical trial of etanercept to treat ankylosing spondylitis. Ann Rheum Dis 2004;63:1594–600.
. Etanercept 50 mg once weekly is as effective as 25 mg twice weekly in patients with ankylosing spondylitis. Ann Rheum Dis 2006;65:1572–7.
. Double-blind placebo-controlled trial of etanercept in the prevention of work disability in ankylosing spondylitis. Ann Rheum Dis 2010;69:1926–8.
. Efficacy of etanercept on rheumatic signs and pulmonary function tests in advanced ankylosing spondylitis: results of a randomised double-blind placebo-controlled study (SPINE). Ann Rheum Dis 2011;70:799–804.
. Efficacy and safety of golimumab in patients with ankylosing spondylitis: results of a randomized, double-blind, placebo-controlled, phase III trial. Arthritis Rheum 2008;58:3402–12.
. Randomized double-blind comparison of chimeric monoclonal antibody to tumor necrosis factor alpha (infliximab) versus placebo in active spondylarthropathy. Arthritis Rheum 2002;46:755–65.
. Infliximab in combination with methotrexate in active ankylosing spondylitis: a clinical and imaging study. Ann Rheum Dis 2005;64:1568–75.
. Clinical and imaging efficacy of etanercept in early non-radiographic axial spondylarthritis: a 12-week, randomized, double blind, placebo-controlled trial. Ann Rheum Dis 2013;72(Suppl):87–87.
. Similar response rates in patients with ankylosing spondylitis and non-radiographic axial spondyloarthritis after 1 year of treatment with etanercept: results from the ESTHER trial. Ann Rheum Dis 2013;72:823–5. Contributors Literature search: JC and AW. Data analysis and main authors of the manuscript: JC and JL. Critical review of and contributions to the manuscript: All authors. Competing interests JC has received lecture/speaker’s honoraria from Pfizer. JS has received grant support, honoraria for consultancy and for being a member of speaker’s bureau from the following companies: Abbvie, Janssen-Cilag, Pfizer, UCB and Merck, and Sharp & Dohme.